Just a brief post to show off one of the things I purchased in Toronto. I found this jacket at Public Butter in Toronto. It's leather, but a very inexpensive, suede-ish leather. It's not vintage, as the brand is sold on the shopping channel (the things you can learn from internet! ), but I still liked it. 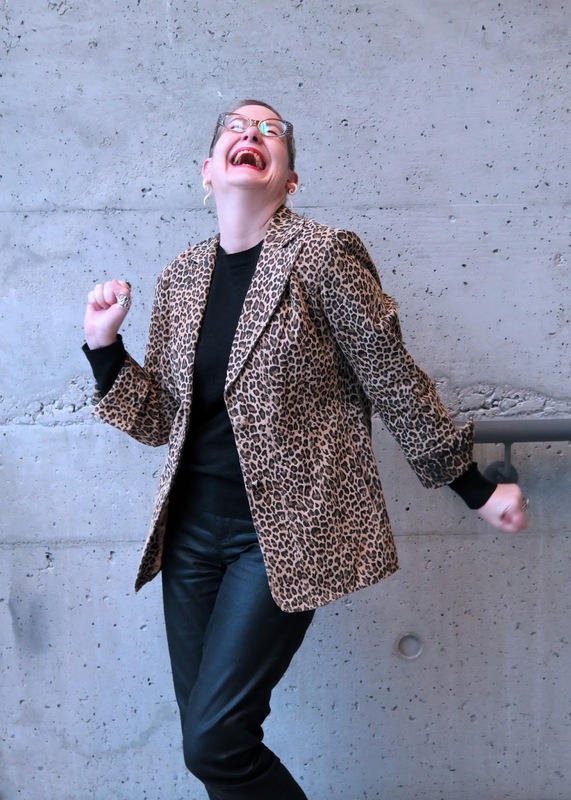 I don't own anything else in leopard print aside from a pair of leggings, and the turned-up cuffs added a bit of "cool" factor to an otherwise straightforward single-breasted jacket. And it was $10. I've been taking posing lessons from Melanie - can you tell? I will never reach her level of expertise at the laughing action shot, but at least I am mixing it up a bit. If you’re reading this, at some point in your life, someone has probably yelled something derogatory at you from a car window, so you likely understand what it feels like to be insulted or disrespected for your appearance or culture. Still Weird Zine is a place for those of us who want to celebrate our weirdness and differences from mainstream society and, as such, we have a zero tolerance policy towards racism, sexism, homophobia, body shaming and any other type of trolling that is hurtful or insulting to a particular person or group, including other music, style or culture-based genres. I received an email from Sheryl Kirby to let me know I was one of their "10 Fabulous Fashion Bloggers Who Are Keeping It Weird". Also included in the list were Melanie, Vix, The Idiosyncratic Fashionistas and Judith so I was in splendid company. I've been called "weird" many times over the course of my life, and I've become good friends with my inner freak, so many thanks to Sheryl and Greg at Still Weird Zine for recognizing a fellow weirdo. Oh, I might just rip that cheap suede blazer right off your back, Shelley! I love it! Your action laughing pose is awesomely weird. Heh, I used to use "weird" to help people spell my name (ei): "Sheila is weird." Thanks for the link-up to that Zine - I will check it out! Hahaha - LOVE your laughing pose, Shelley. If you felt sufficiently dorkish while posing, I'd say you've graduated with flying colours. I'd send you a trophy with a huge grin on it if I had one. Did you make sound effects? And EXCELLENT jacket. I love it. The first silhouette shot is awesome. Superb head shape. As for being weird, hurrah!! Like you, I am honoured to be in such cool company. Still Weird Zine is a great blog. I love their Xmas gift ideas. That jacket is fabulous, I want to stroke it! Hey, we've got all the weirdos right in a row here! woo-hoo. And this is even one of your tamer ensembles. But it's the pose that does it, baby and the attitude. Not to mention the hair do. I have to check out that zine, tout de suite. 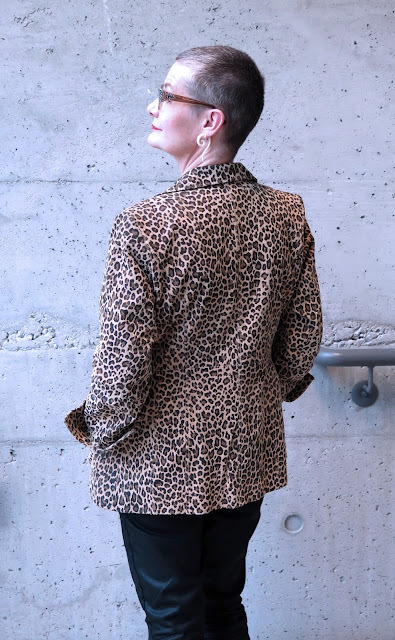 I'm a fan of leopard print, so this jacket was a find, as far as I'm concerned. Love the "Melanie Pose" and it was a great honor to be "Weird" with the likes of you and the other bloggers who I adore. Your hair is a sensation in the top photo! The laughing action shot - I must practice also. Still Weird Zine has some neat alternative ideas for Christmas. Ha ha! I love that pose! I must also practise this. I have a feeling it is a special skill to master. I love leopard print so I love this. I think it is much better to be weird or eccentric (what I'm often called) than boring and day. Like this quote, "I'd rather be looked over than overlooked." nice jacket, you never know where cool stuff will turn up. I'll have to check out Still Weird Zine, because I am. Oh what a wonderful jacket. I have something similar but not in leather. Just fabric. Yours is beautiful. But.... not weird. So with this outfit you won't make it to the next weird bloggers issue of Still Weird Zine. Never mind, you have been featured already YAY. Congratulations. I totally agree with their "Note About Inclusivity". I myself have never been insulted or such as I was never weird (enough). But I do agree with the zero tolerance policy for everything they say. Always have, even when I was a small kid. I never teased or harassed people because of what they looked like. Not even when they harassed me for being skinny (they will always find something and I am an easy target as you can needle me very quickly). Anyway... lovely jacket and I still love your short hair. add a cool handbag and you can totally mix in the crowd.